I’ve been craving hot pies this week. For me, they’re the ultimate comfort food when the weather turns chilly. Rather than buy some cheap, nasty meat pies from the supermarket, today I decided to try my hand at making my own. I came across this recipe in an old magazine, and I modified it a little to suit my own personal tastes. It’s a really easy recipe, and the end result is so tasty. – 2 zucchini, halved lengthways and cut into 3cm chunks. – 1/2 butternut pumpkin, cut into 3cm pieces. 1. Pre-heat your oven to 190 degrees. Line a baking tray with baking paper and spread the vegetables and garlic over the tray. Give the vegies a generous spray with the oil. Sprinkle the thyme and pepper over the vegetables. Roast the vegetables for 25 minutes, turning once. Remove them from the oven and then allow them to cool. 2. Line 2 baking trays with baking paper. Use a bowl as a guide to cut out 6 circles of short-crust pastry. 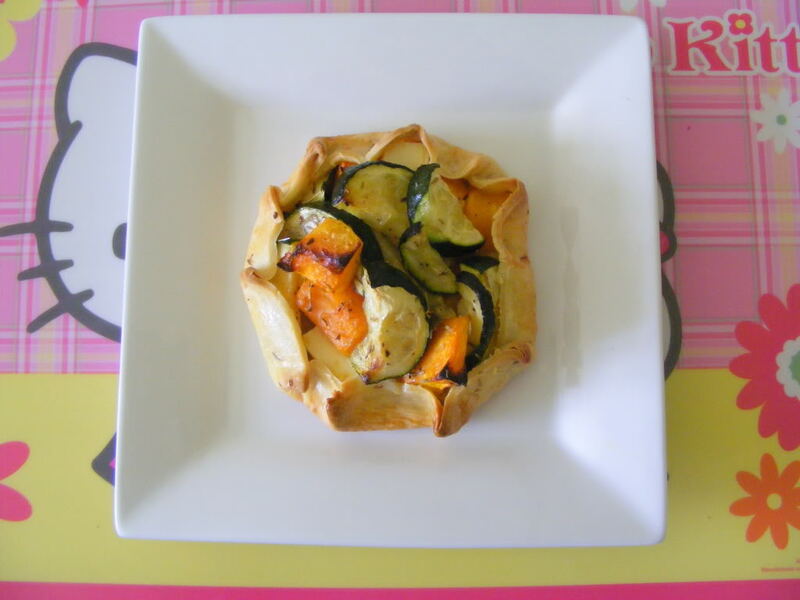 Crumble the fetta cheese over the middle of each pastry round, and then top with the vegetables. Leave a 3cm border around the edge. Fold the pastry up over the vegetables, pleating the edges with your fingers so they stay in place. Lightly brush the pastry with the egg wash.
3. Bake the pies for 25-30 minutes, until the pastry is golden-brown. This recipe makes 6 pies. You can substitute any vegetables you like for the filling. Potato, leek, squash or eggplant would also work well.